We are happily rolling out the new update 1.17.0 that contains important fixes and improvements, mainly for Mi Band 2, but not only. Let's go through them. You can configure which items on the screen are visible. It's possible to allow the screen to highlight when you lift your wrist. 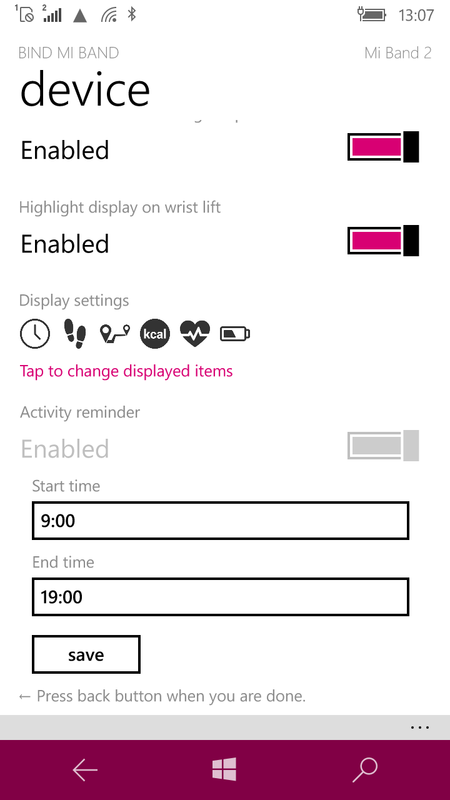 You can configure activity reminder, enable and disable it, set when it should work. 2. Everywhere around the app now we show date and time in your regional format settings. In the same format it should be visible on the screen of your Mi Band 2. 3. Now it's possible to set up to 10 alarms for Mi Band 2 (and up to 3 for older bands, as it was before). 4. Major fixes in synchronization for both Mi Band 2 and Mi Band 1. 5. Small stability, speed and UX fixes. Well, it's quite a long list. We hope that you will like the changes. Some other info regarding Mi Band 2. It seems like that in the latest public firmware we have even more settings for display, like date displaying and "do not disturb" mode. We will add that in future releases, please, be sure. The same concerns firmware update for Mi Band 2. Talking about the smart alarm in Mi Band 2, as users are reporting, it doesn't work. We can only say that we submit this setting to the band, but it seems to be not supported by firmware or hardware. That brings some confusion, so maybe we will remove the setting from alarm configuration in future. They seem to work (woohoo!) and we plan to publish first builds containing this feature during September. We know that you are eager to try that, so as soon, as we have something reliable to show, we will present a public beta-version. Well, that's the plan and hopefully, everything will go fine. UPDATE 1.17.1: Translations update and improvements on sleep tracking for Mi Band 2. UPDATE 1.17.2: Translations update and improvements on sleep tracking. Great updates! Looking forward to see the notification! Any news about continious measuring of the heartrate? Hi team. Thank you for your effort. I have supported you by buying two lifetime applications, one for me and one for my wife. These improvements are great. I am looking forward to the date displaying and DND. Keep working on it. People are complaining that the smart alarm was removed. Hi! I have 2 questions: How does activity reminder works? There is no word about it. 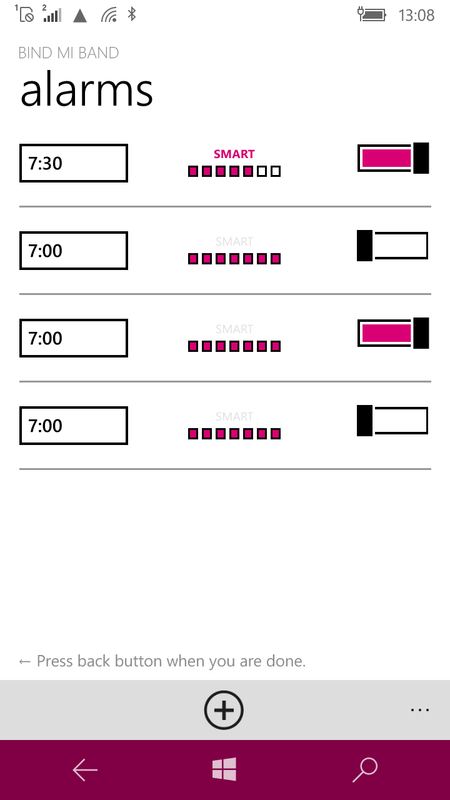 Second thing - can you add to app continously heart rate monitor with graphic chart? It will be very useful option to excersise. firmware upgrade is not possible? Speriamo arrivino presto le notifiche, così il mio MI4 potrebbe durare tanto tempo ancora. I would love that feature to as I dont have any iphone or andriod telephone! Great news, looking forward to notifications. why so many changes only for mi band 2, it will not work on mi band 1? My hearts rate monitor stopped working. Did it happen to anyone else?? Had the same problem, after updating the firmware using an android phone and mi fit, it's back! Молодцы! Ждем остальные обещанные функции. И, ребят, переходите уже а W10m дизайн: ползунки выглядят неказисто, по ощущениям, как WP7. Благодарю за работу! The new version that supports MiBand2 still isn't availble in the store for Windows 8.1! I cant bind my band to the app....always showing error! The application is getting better and better, congratulations! I look forward to the same support notifications. It would also be interesting to a universal version, so that we can access the data even by computer. tell whether soon support the notification of calls and messages to 10 windows mobile? asking when not speed to get this feature. BE PATIENT! Take all the time you need to get it right. You're doing a fantastic job. Todas i received a minor update that made the app to to the version 1.17.1. Is there any significante changes? Thanks you and keep the good work! "UPDATE 1.17.1: Translations update and improvements on sleep tracking for Mi Band 2." 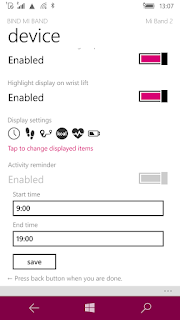 Windows Phone 8.1 is the problem at the beginning of inactivity reminders work. After changing schedules, nothing. Reminders do not work anymore, even by installing the application again. As if Miband2 was corrupt. How to do ? Two days without sleep info. Cardio and steps counter work fine. Me too !!!! Mi band 1S on W10 release. Sleep info not working !! Can be related to 1.17.1 update ??? I'm with Mi band 1s on w10 release, update 1.17.1 and working great. Maybe you need update the firmware of the band. I updated the firmware via bluetooth with Bind Me Band and all is working ok! My 1S firmware is updated already and does not work the sleep info. Uninstalled app and unpair miband. Today I have sleep info working again. any beta test opened for notifications ? I have activated the option to measure heartrate during sleep, but cannot find the data regarding heartbeats. I always thought it was used just to give a more accurate measure of sleep, not to show heart rate during sleep. Am I wrong? Update?? was it a bug fix? Hi! I'm planning to buy a Mi Band 2 and this app for my Lumia. Is firmware update available over this app or do I have to use android? Hi! I made the firmware update to the mi band 1s with Bind Mi Band app and it went ok! Still think you will make a September release with notification support? Cutting it fine for a September release......you trying to build the tension?? Неплохо бы добавить хотя бы оповещение о новой прошивке. А-то miband2 теперь и дату может показывать, а мы и не в курсе. И можно ли допилить включение нового типа часов (с датой). Ok Since The latest Insider Build App is Not Working, i have done a reinstall and Nothing.. Hope you can fix this soon. Its pair with bluetooth but application always say not found. I use version 14946.1000 of windows 10 on my phone. How i cant fiz this problem?